Residents and leaders have seen better planning, positive changes. Clarke Square. Photo courtesy of NNS. Clarke Square residents Marta Alamo and her husband initially opposed the installation in Mitchell Park of an NFL practice football field donated by the Green Bay Packers. Now that the field is in place and in use, she says it’s a nice change to the park. The Alamos’ feelings changed because when they objected about the field’s planned location, littering at the previous practice area and parents not picking their children up promptly, community leaders listened and responded. Coaches and others communicated with parents about pick-ups and littering, and the field’s location was changed in the 2012 redesign of the Mitchell Park Plan. 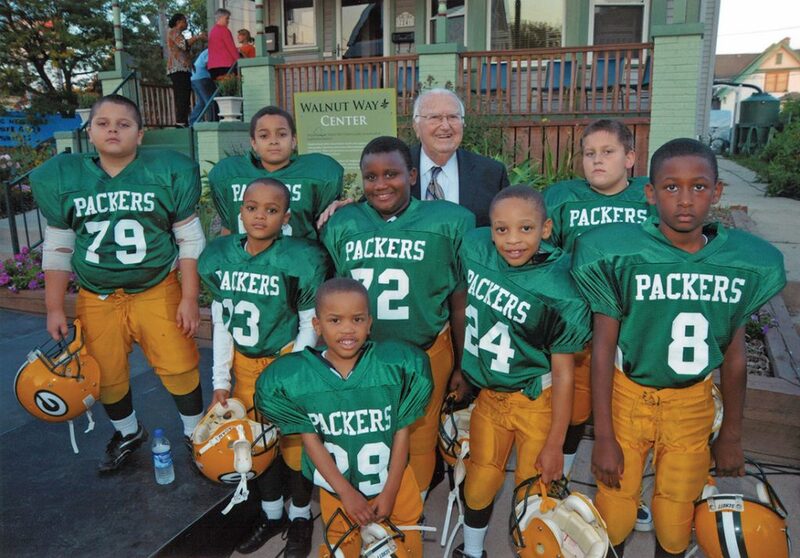 Joe Zilber poses with members of the Journey House Packers in September 2008 when he announced the Zilber Neighborhood Initiative grant at Walnut Way. Photo courtesy of Zilber Family Foundation/NNS. “I’m glad that the neighbors were heard,” Alamo said. The Clarke Square Neighborhood Initiative, originally a program of Journey House, is adept at listening to its neighbors. CSNI, which focuses on housing, economic development, public safety and health and wellness, defines neighbors broadly as anyone who lives, works, goes to school, worships, shops, plays, visits family or friends or spends time for any reason in Clarke Square. 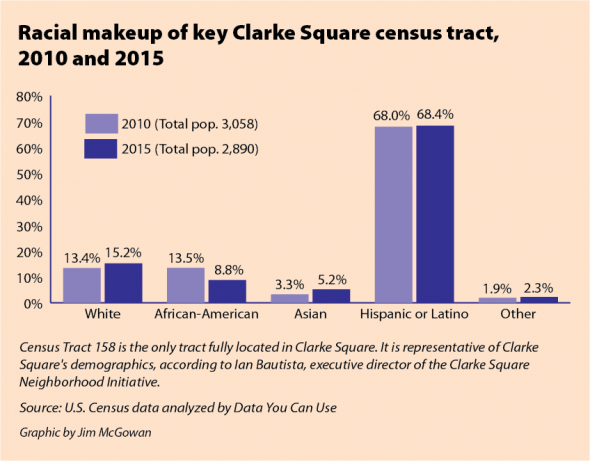 The smallest of three neighborhoods the Zilber Family Foundation selected for its $50 million Zilber Neighborhood Initiative, Clarke Square comprises approximately 8,000 residents in 35 square blocks of residential and commercial space. Ten additional blocks include parks, parking lots and large buildings such as the Longfellow School/Journey House campus and the former Pick ‘n Save on National Avenue. By Milwaukee standards, the population density is high, said Ian Bautista, executive director of CSNI. The demographic composition of the neighborhood, which, historically, was home to waves of European immigrants, has remained fairly consistent in the last decade, Bautista said. Approximately 70 percent of residents identify as Latino. About 15 percent are white, 9 percent are African-American, 5 percent are Asian-American, 1 percent are Native American and the remainder are “other races” or two or more races, Bautista said. “What has changed slightly is that more of the Latino population is Puerto Rican,” he said, citing Puerto Rico’s weak economy and the destruction Hurricane Maria wreaked on the island in September 2017. Journey House has been a main provider of services including adult education and youth programming in the diverse neighborhood since 1969. The late Joe Zilber was involved with leaders at Journey House and was looking for an organization that people who lived in the neighborhood would trust, said Susan Lloyd, former executive director of the Zilber Family Foundation. The foundation selected Journey House as the lead organization in Clarke Square when ZNI began in 2008. As it did in each of the three ZNI neighborhoods, the foundation funded and facilitated a community planning process. The Clarke Square Neighborhood Initiative kicked off its first event as an independent organization with a meeting on April 30, 2009. The 435 neighbors who attended were asked to complete three sentences, identifying the best thing about Clarke Square, something they would like to change and something that is needed. Their answers provided the foundation for the neighborhood’s Quality of Life Plan, which identified nine strategies and 14 catalytic projects residents hoped to see completed over the 10-year initiative (see accompanying article). The Quality of Life Plan strategies are: community-school partnership; lifelong learning; employment and job training; youth, parks and recreation; social connections; public safety; neighborhood beautification; and housing and economic development. The community later added a 10th strategy, Project 10, which focuses on emotional health and wellbeing, physical and spiritual wellness, and economic prosperity. Alamo, an engaged resident of 26 years and owner of five properties in the northwest corner of the neighborhood across from Mitchell Park, attended that April 2009 meeting. She said she is grateful for Zilber’s investment in her neighborhood and believes the initiative has especially benefitted the community’s children. According to Erin Frederick, program director at the Zilber Family Foundation, much of the community’s vision for Mitchell Park has been realized. Partnerships with Marquette’s junior varsity lacrosse team, Artists Working in Education and a CSNI summer concert series are good examples of “putting some investment into the park and a lot of partners coming together to activate the space,” she said. Improving the lives and prospects of the community’s children and parents has long been a primary goal of Journey House’s programs. CEO Michele Bria, who started there as associate director in 1996, came with a strong interest in community-school partnerships, the subject of her doctoral dissertation. 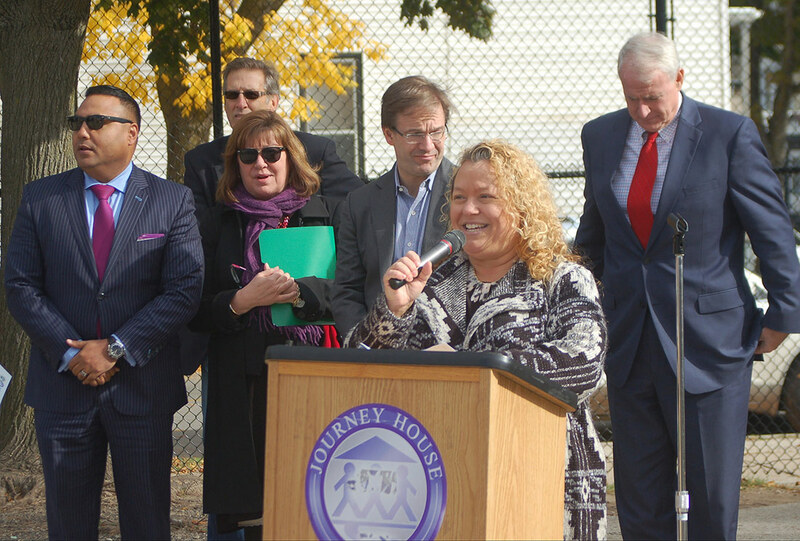 Journey House CEO Michele Bria addresses the crowd during the grand opening event for the second Journey House campus property. Photo by Edgar Mendez/NNS. The Journey House Longfellow Center for Family Learning and Youth Athletics is the infrastructure project that best exemplifies the impact the Zilber Neighborhood Initiative has had on Clarke Square, Bria said. “Because we knew we shared the same families that this wonderful public school, Longfellow, serves … it was really important for us to partner,” she said. Long before the two entities built a shared addition to the school and before there were federal programs to establish community learning centers in low-income communities, Journey House and Longfellow collaborated to provide those services. Working together enabled them to see their common need for space and more ways they might share resources, Bria said. Delayed by the 2008 recession, the new Journey House addition to Longfellow School was completed in spring 2012. It brought Journey House’s administrative offices and programs formerly located at three different sites under one roof. The new center included a gymnasium, cafeteria, dance studio, state-of-the-art computer lab, teen lounge and classrooms. Bria called the center “a dream come true.” Events that were once limited by space to 150 people now bring in 1,000. Family events, “that engage everyone and that are just fun,” help build stronger families and deeper connections among parents and residents, she said. “When we moved in here, we moved into a space that honors our children and families. It’s become this magical space where, from birth to twilight, there are activities and opportunities for everyone,” Bria said. Another way that Zilber empowered the community, Bria said, was by facilitating Journey House’s partnership with the International Association for Human Values. The association’s Youth Empowerment Seminar, which Journey House has used for the past eight years, teaches focused breathing techniques to decrease stress and increase performance, Bria said. “We believe in it so much that it’s on all of our job descriptions. We run the program for all of our youth ages 9 and over. All our teachers, coaches, parents and leaders go through the program,” she said. In its workforce development program, THRIVE, Journey House also uses a trauma-informed care practice called Community Building, which assists people in addressing personal trauma and understanding “how to move on and be all they can be,” Bria said. Bautista agrees that the Journey House Longfellow School Center “was probably the biggest and most catalytic success” of the Zilber Neighborhood Initiative in Clarke Square. “People of so many different age groups benefit from activities in that facility,” said Quentin Prince, director of youth leadership and student success at Longfellow School. He also leads several Journey House programs. The public/private partnership between Longfellow and Journey House that created the campus space he called “the hub of the community” has had a big impact on his work. Prince, 36, grew up in Garden Homes and now lives in Sherman Park, but he has spent almost half his life working in Clarke Square. 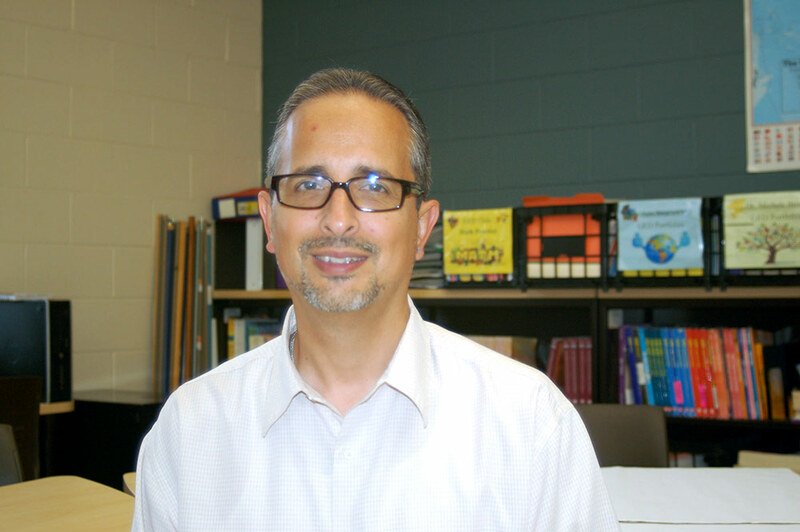 In addition to his work teaching character education, facilitating Longfellow’s structured study hall program and helping coach Journey House athletics, Prince facilitates workforce development for youth and adults. “When you have adults in the neighborhood who can come to a place and attain certain skills and knowledge that will help them become successful in the workforce, that’s something that is uplifting and powerful for the community,” he said. Clarke Square has seen its share of issues with crime and violence, Prince said, “but with ZNI and the driving force of CSNI, the neighborhood has taken on a new life. Residents understand that there is a focus on their area and there are people willing to contribute to their prosperity,” Prince said. Ian Bautista said he is particularly proud of CSNI’s accomplishments on Chavez Drive in recent years. In addition to reconstituting the Chavez Business Improvement District, CSNI commissioned and installed a bronze statue of the labor activist and Mexican-American civil rights leader Cesar E. Chavez. The statue stands in front of the Nuevo Mercado El Rey at 916 S. Chavez Drive. Ian Bautista, executive director, Clarke Square Neighborhood Initiative, poses at Journey House. Photo by Andrea Waxman/NNS. Bautista said the statue inspires residents to recognize and learn about Chavez, Delores Huerta, the United Farm Workers and “the local iterations and expressions of that movement.” He noted that Latino civil rights and labor leaders such as Jesus Salas and Ernesto Chacon still live in the neighborhood. Through its economic development initiative, “The Farm Project,” named in honor of Chavez’s work on behalf of farm workers, CSNI and the BID work with partners to seed arts and culture on the commercial corridor and create connections among artists, residents and business owners. Last year The Farm Project collaborated with the Mary L. Nohl Fund at the Greater Milwaukee Foundation and other donors to sponsor the first Chavez BID Artist in Residence, Erick Ledesma. Artist Isabel Castro was selected for the residency this year. CSNI has also worked to help residents repair and update their houses through partnerships with ACTS Housing, Housing Resources Inc. and Revitalize Milwaukee’s Block Build MKE program. According to Frederick, “Between January 2016 and May 2017 homeowners in Clarke Square invested nearly $340,000 in 30 home improvement projects through a home improvement matching grant program. An additional $55,400 in grant dollars brought that to a total of $400,00 invested,” she said. Journey House also worked on the housing front when it launched an initiative to purchase and rehabilitate city-owned, boarded-up nuisance properties for youth aging out of foster care. Using private investment and its workforce training construction program participants, Journey House renovated 14 units in four buildings and turned them into affordable housing. Proximity to Journey House and its support programs is an additional benefit for the young occupants who are living on their own for the first time. Clarke Square neighbors interviewed all spoke of their appreciation for the diversity of their community’s population. As in all neighborhoods, however, there are conditions that they want to fix. Many are frustrated with the continuing problems of prostitution, drugs and related crime. Ongoing major construction on Greenfield Avenue during the summer pushed the problem into other parts of the neighborhood, they said. Tyna Rule, CSNI board president, said that the organization has convened a multidisciplinary team that meets monthly to address public safety issues. Residents can come and exchange information with representatives from the city attorney’s office, the police and sheriff’s departments and Ald. Bob Donovan, as well as partners from Safe & Sound, Journey House and other organizations, Rule said. When prostitution expanded to the McDonald’s at 25th and National, residents raised concerns and got a commitment from the business to hire additional security. “We all want to be in a safe neighborhood,” Rule said. She said she wishes more of the Zilber Neighborhood Initiative funds had been used to revitalize National Avenue, which she described as “busy and unpleasant to walk down” and on investments that benefit the elderly. Despite challenges facing the neighborhood, Rule is excited about the blossoming of art, creativity and entrepreneurship in the last two or three years, which she said is one of the best results of Zilber’s investment in Clarke Square. “We are a gem of a neighborhood” located close to downtown “with a little bit of everything,” Rule said. She added that the planning and implementation of the Quality of Life Plan have mobilized and energized residents and inspired more people to take on community leadership roles.